Aktiivinen kansalainen haluaa kehittää kykyjään ja sitoutuu todennäköisesti yhteiskunnalliseen vaikuttamiseen. Suora demokratia luo myös yhteenkuuluvuuden tunnetta ja yhteisöllisyyttä, joka voittaa henkilökohtaiset intressit. Vuorovaikutuksessa kansalaisten kanssa päätöksentekoon voidaan tuottaa erilaisia näkökulmia huomioivaa tietoa, keskustelua ja vaihtoehtoisia ratkaisuja. Vuorovaikutteinen hallinto ilmastokysymyksissä –artikkelissa Irmeli Mustalahti Itä-Suomen yliopistosta, Kaisa Matschoss Helsingin yliopistosta ja ohjelmakoordinaattori Maija Hyle Helsingin Diakonissalaitoksesta korostavat osallistavan ja vuorovaikutteisen luonnonvarahallinnon merkitystä, kun paikalliset ihmiset halutaan vastaamaan ja päättämään oman elinympäristönsä kehittämisestä. Vuorovaikutteisen luonnonvarahallinnon kolmena vahvuutena ja haasteena ilmastokysymyksissä kirjoittajat pitävät paikallistason hyötyjä, hyvän hallinnon tukemista sekä luonnonvarojen hoidon ja suojelun tehostamista. 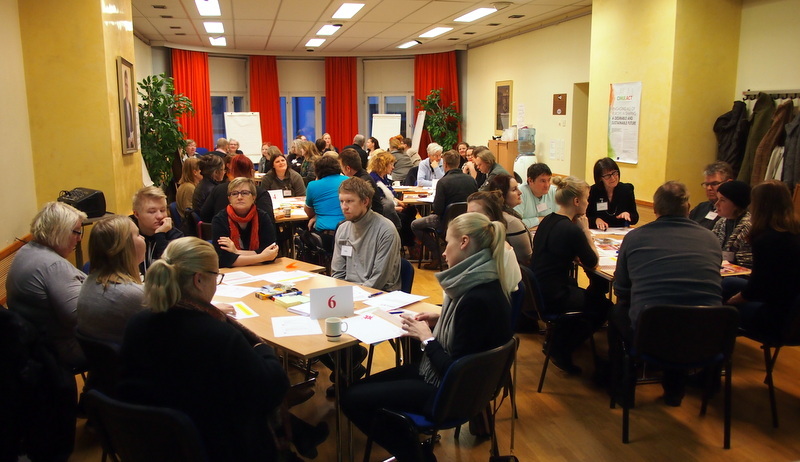 The NCV workshop in Helsinki was part of a series of CIMULACT workshops across 30 European countries, contributing to a total of 180 citizen visions. These visions will be developed to research priorities and policy advice for the European Commission’s Horizon 2020 programme at latter stages of the CIMULACT project. More information on the CIMULACT project is available at www.cimulact.eu. Helsingin visiotyöpaja oli osa CIMULACT-hankkeen toteuttamaa työpajasarjaa, jossa kansalaiset kehittivät 180 visiota 30 Euroopan maassa. Visioiden pohjalta hankkeessa kehitetään tutkimusprioriteettejä ja politiikkasuosituksia Euroopan komission Horisontti 2020 –ohjelmaan. Lisätietoa CIMULACT-hankkeesta ja sen etenemisestä löytyy osoitteesta www.cimulact.eu. Identify and assess the role of intermediaries in creating, channeling and coordinating market and broader societal demand for new low carbon technologies and services and in adapting these technologies to local contexts. Establish the influence of different intermediary organizations and forms of work on different types of energy innovation and energy transition processes. Examine how energy transition intermediaries come into being, establish their functional roles, evolve, and gain legitimacy. Compare intermediation in different contexts (between government and citizens, between energy and technology providers and users) and in different actor configurations (including or excluding certain market/societal actors) and organizational settings. Distinguish between generic aspects of intermediation in energy transitions, and aspects that are specific to particular contexts or configurations. CSRC is in charge of sub-project 1, which buildings on case studies of intermediation in the interface between energy consumption and production. Contact: Eva Heiskanen (eva.heiskanen@helsinki.fi) ja Kaisa Matschoss (kaisa.matschoss@helsinki.fi). CIMULACT from Strategic Design Scenarios on Vimeo. Embrace the citizens in the actual formulation of EU Research and Innovation agendas. Provide concrete and unique input to the identification of the future European research agenda by eliciting concerns, wishes and visions for desirable sustainable futures from 1000 citizens in 30 countries in Europe. Make the future more accessible and commonly shared and discussed by making it a public conversation for a greater democracy. Make the European research and innovation agenda relevant and accountable to society by engaging citizens, stakeholders, and experts in co-creating research agendas based on real, validated and shared visions, needs and demands. Contribute to Responsible Research and Innovation (RRI) in EU by promoting public engagement and inclusion in the identification of desirable sustainable futures. Set a new standard for citizen participation by integrating science and society and through development, experimentation, training and assessment of methods for engagement. Public engagement in science and technology is gaining increasing attention. Societal challenges and advances in science and technology call for new initiatives, platforms and opportunities for engaging the public in non-traditional ways. This catalogue, produced by the PE2020 project, explores and analyses particularly innovative public engagement practices, and provides a platform for international inspiration and learning in the fast-moving field of public engagement. The catalogue presents detailed case descriptions and first-hand reflections provided by individual case coordinators with particular expertise with the initiative. Who are the pioneering users in energy efficiency service markets? This article studies the structure of the energy efficiency service markets in Finland. The research focuses on studying who are the most pioneering users of energy efficiency services. In a previous paper, consumer’s interest in different types of innovative energy efficiency services was identified. Psychographic characteristics were found that describe people according to their leaduserness, skepticism and mass market following behavior. differ statistically from the mass market consumers. Matschoss and Kahma (2015). Service interest and cluster membership – Who are the pioneering users in energy efficiency service markets? Nordic Journal of Business 64, 2, 139-159.